It's countdown week. After all the time we've spent working toward moving, it's finally just a few short days away. I still panic frequently. Sure this is what I want. This is what I asked for. But that doesn't make it easy. Thirteen years in place is not nothing. There's a level of comfort to be found even in places we've grown out of. Letting go is not as easy as I imagined it would be. And as much as I'm all in for moving forward and exploring the next part of my life, I sometimes need a little help when I start to freak out about all the unknowns. I joke about wishing for a bucket of Xanax, but that's not really my style. I will admit to enjoying a few more tasty adult beverages that normal in recent weeks, and the homeopathic Calms Forte a friend recommended helps a little bit. 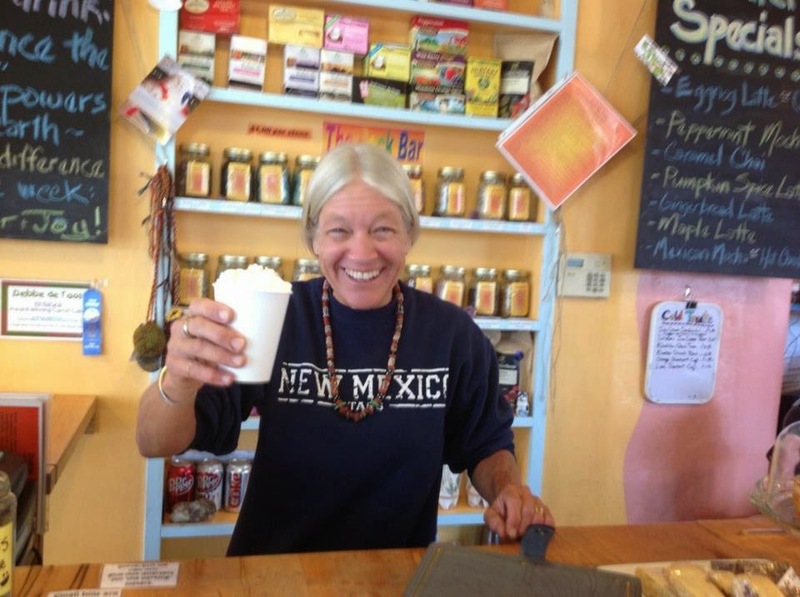 But this is Taos, and often there are alternatives to mainstream de-stressors. Take for instance our favorite little coffee place, Coffee Cats, who advises patrons to "put a rock in it." A rock in my coffee (or tea, or martini)? Yes, it's true. Rick and I are regular imbibers of "rocktails," and have a pretty extensive collection of rocks to reuse at home. According to Coffee Cats, every rock has a different energy, and each stone they sell is not only safe to plunk into your drink of choice, but also has specific qualities to help you shift your own energy patterns. Amazingly (or not, if you're of a certain-mindedness), putting a rock in your drink will also improve the taste. I've tested it many times. It's true. 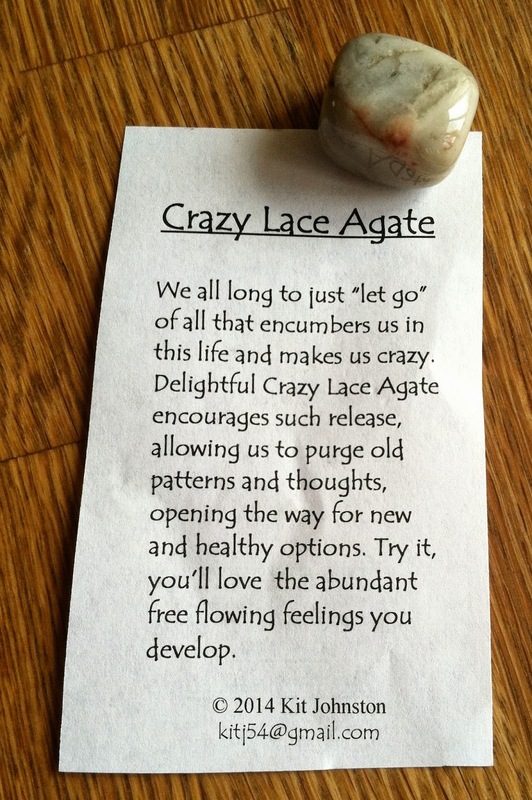 My rock of choice these days is Crazy Lace Agate, which is the Letting Go stone. It really does seem to be helping. I know that not letting go only causes pain. I also know that only open hands are able to catch new things that fall their way. A tight grip on anything, be it physical or mental, closes us off to fresh adventures. So with a few more days to blast-off, I'm working my pretty little hunk of Crazy Lace Agate for all it's worth - which appears to be considerably more than the dollar I paid for it. Living in an adobe house all these years has been literally like living in the earth. It's very grounding - sometimes to the point of feeling buried in it - but grounding none the less. Now my sense of grounding, balance, place, and even person are being shaken loose. The tentative roots I put down here run deeper than I thought they did. The idea (and it's only an idea, because I can't see into the future) that I will feel anonymous, even invisible, in a new place, makes me swing back and forth from giddy to queasy, and all points in between. All of these feelings came up unexpectedly. I really thought I was ready to just pack up and push off. But here I am, struggling one day, dancing the next, trusting the process, and appreciating all the support I'm getting from a few close friends and a humble rock that's somehow helping me keep my balance as I fling myself out into the world one more time. Whatever it takes. We're in some wild times, all of us. Last night a friend gave me (us) a small heart shaped piece of rose quartz, which is the Love Stone that opens up the heart chakra. That's a lot of blah, blah, blah to some people, but to me it's a precious gift, from the heart, from a deep level of knowing and supporting us on our way. We've let go of so many of our things, but this one little thing is going along for the ride. 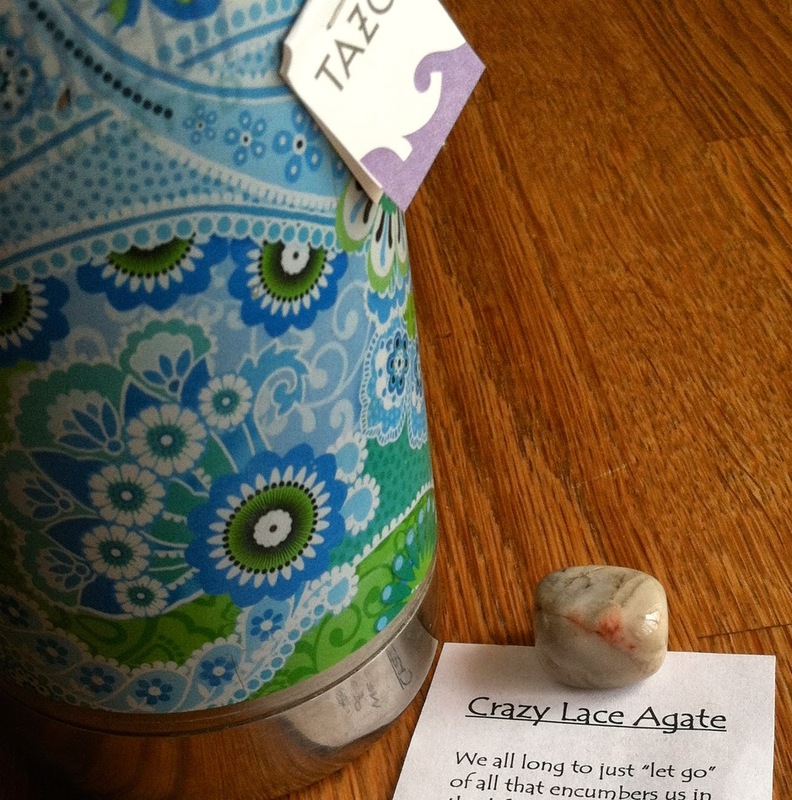 I might even add it to my tea, along with the Crazy Lace Agate. It can't hurt, and it will probably help. I don't mean this to be a review of Coffee Cats, but I do love the place, and will miss it when we leave. Visit them if you can someday. They sell a complete set of all their rocks, along with descriptions of the properties of each. I'm not sure, but maybe they'd mail-order a set to you if you give them a call and ask really sweetly. Oh, and don't just throw any old rock in your drink. Not all of them are safe to sip. rocks are just ahead of you now...how exciting!!!! Safe, healing energy surrounds you. Perhaps we can meet up in San Jose one day. Well written words!! Since I came home with many treasures from Taos I have not been able to make the leap into the artistic world, probably because of some of the things you speak of here. I admire your strength but also understand your feelings about change. If I were 30 years younger, I might be able to switch things up now that I know what I know. Big changes are huge emotionally. From the adventures I have seen you and Rick take, I do believe it will all be good, for both of you. Letting go, well just say see you later, you can always re-visit !! April, your Colorado friend !! Last year I had to move away from my beloved little home town of Sebastopol, CA. Like you, I was on a brand new adventure, AND for the 1st time in 30 years, going it alone. Leaving behind the schools and community I worked and raised my children in, the house I decorated and landscaped, friends and neighbors of 25 years... needless to say it was an emotional and physical roller coaster ride. (Now, I won't go into the fact that I was also dealing with my divorce and had just purchased a fix-er-upper home that was only fit for the rodents that lived there!) Yes, I can admit to hugging bottles of scotch while having bouts of uncontrolled sobbing during this transition. YOU WILL SURVIVE THIS AND LIVE TO FLOURISH, I promise! You have a hubby and family, and friends to hold your hands. Next thing ya know you'll be planting flowers in your new backyard and this will all be behind you. Keep soaking those rocks in your drinks and/or wearing them close to your body!! My stone of choice (I wore it in a pouch necklace) was aventurine: "releases anxiety and fear, boosts tranquility; promotes decisiveness and leadership skills." My blessings on your journey.